International wildlife charity the Born Free Foundation marks World Orca Day on July 14 with an integrated campaign which sees Ocean Outdoor’s spectacular large format full motion out of home screens transformed into virtual tanks. Conceived by WCRS, a winner of Ocean Outdoor’s annual digital creative competition, #TankFree uses CGI technology and visual effects from The Mill London to create a series of magnificent life size animated orcas which the public are invited to set free from captivity and return to their natural habitats. Over the course of World Orca Day (July 14), supporters will be asked to help free captive orcas by texting a donation to Born Free. 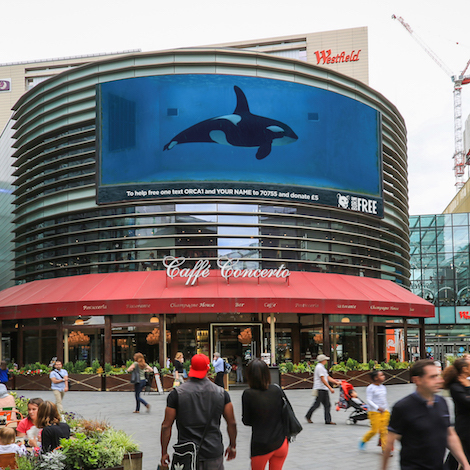 Each GBP 5 donation received causes a captive orca to jump out of the DOOH screen and swim through other nearby sites to freedom. Its escape triggers the arrival of another captive orca, which swims into the virtual tank, triggering further donations. #TankFree will feature for the day across five ‘hero’ city centre locations including Westfield Stratford, London, the Birmingham Media Eyes, Liverpool Media Wall, The Screen @Arndale in Manchester and St Enoch, Glasgow, from where the captive Orcas will be freed. A further six Ocean screens will carry supporting graphics to raise awareness and donations on the same day (July 14). Out of home and experiential activity will be supported by prominent Born Free celebrity patron Lady Victoria Hervey, who will visit Westfield Stratford to see the campaign for herself on July 14. Born Free will promote the day’s activities widely on social media, using #TankFree to encourage engagement across the country. WCRS is a creative agency, combining more than 35 years of brand building expertise with the ability to execute ideas in any channel. The agency’s focus is to create work people care about. In whatever form that takes. Developing ideas everywhere from TV to Twitter, online to mobile, games to music downloads. Submissions to Ocean’s 2017 creative digital competition are now open. This entry was posted on Wednesday, July 12th, 2017 at 13:12 @591 and is filed under DailyDOOH Update. You can follow any responses to this entry through the RSS 2.0 feed. You can leave a response, or trackback from your own site.